A recent research by the University of Toronto’s department of psychology in the Faculty of Arts & Science has found out that exposure to prosperity gospel (PG) makes you more likely to show an exaggerated and unrealistic sense of optimism for life and take more financial risks. Now this is very interesting especially that it is coming from a non-Christian institution. Here Hobson has put his finger on it and it should not surprise us because that’s exactly what the Bible teaches. PG is not the gospel. There is only one gospel, the gospel of Jesus Christ and him crucified. The PG is neither about nor for Christ but actually against Christ. This is why Apostle Paul anathematizes anyone who preaches it: “But even if we or an angel from heaven should preach to you a gospel contrary to the one we preached to you, let him be accursed. As we have said it before, so now I say again: If anyone is preaching to you a gospel contrary to the one you received, let him be accursed” (Gal. 1:8, 9). Further as the research notes, PG is about manipulating people through their volatile emotions rather than pointing them to their greatest need of salvation in Christ. Apostle Peter already warned us against the destructive nature of PG. Writing of devious and false teachers who include PG preachers the apostle cautioned: “But false prophets also arose among the people, just as there will be false teachers among you…And in their greed they will exploit you (“make merchandize of you,” KJV) with false words” (2 Peter 2:1-4). There is no better description of the PG and its preachers than what the apostle gives here. The PG never seeks the good of its hearers but as lie from the pit of hell seeks to destroy them. The PG has been weighed on the secular scale and has been found wanting. No need to mention that it also fails miserably on the biblical scale. So to those who are still trapped in the yoke of PG, hear the words of the gospel of Christ. Christ’s greatest gift is not material wealth. It is not an excellent health. These he can give if he pleases. His greatest gift is salvation from the wrath of come. Christ is the bread of life that endures to eternity. Labour not for the riches of this world, which are here today and gone tomorrow. What shall it profit you if you gain the whole world but lose your own soul? Come to Christ, rest in him, labour faithfully with your hands, and trust him to provide for all your needs (Matt. 6:25-34). A few days ago I received a letter from an old friend. We first met in secondary school and one thing that brought us together was our religion then, Rastafarianism. However, the Lord was gracious to both of us. The Lord saved my friend a year before he saved me. After our secondary days, we parted ways and never knew what was going in each other’s life until recently when my friend through his brother traced me and sent me this letter. When I finished reading it, I was angry but also sorrowful at the reality of the agony that prosperity “gospel” is bringing to many in my motherland, Malawi. Greetings in the name of our Lord and Savior, Jesus Christ. It has been a long time…Time really flies. But memories are still fresh of us eating chiwaya pa Bright pa break. Kale lokoma ndi losayiwalika (during break time we used to go and have pieces of fried potatoes commonly called chips at a place owned by a man simply known as Bright). Anyway, the main reason for writing this letter is to share with you what has happened in my life. Probably, you heard that I was arrested and charged with three accounts: abuse of office, corruption and theft by public servant. As I am writing now I am in one of the prisons in our country waiting for trial. For you own information, I will plead guilty to all these charges because I am indeed guilty, and I don’t intend to contest against them when my trial begins. We believed and incessantly absorbed this “truth.” He challenged us to pray and claim these blessings for ourselves in Jesus name. Indeed it seemed to work. Many of my friends began to do well. They secured better- paying jobs. Some started business which within a few years were growing and thriving wonderfully. But it was not so with me. I prayed and fasted but things didn’t seem to work. I approached my pastor a number of times and asked him why I was not prospering like my friends. He replied and said that that my faith was weak. He challenged me to fast more and pray more. He also observed that I was probably not faithful in my giving to the church. “You cannot have God’s blessings if you do not sow faithfully and abundantly,” he challenged me. Friend, from that time onwards, I prayed harder and fasted even more. I remember one time, I took a one-week leave from my organization to go to a mountain to fast and pray for three days also called Esther’s fasting. That month and the following months, I took almost half of my salary and gave it as “tithe” to the man of God. I sowed the seed faithfully and waited for the harvest but to my surprise no single blessing came. Every Sunday when I went to church I felt like a failure as I listened to my friends giving testimonies of how God was blessing them. I felt that I was not a true Christian since most of my friends were driving nice cars, but I was still walking to church. “You are of little faith, my brother. Put your faith into action. Trust the Lord more and give more and he will bless you,” my pastor challenged me again after I poured out my frustrations to him. The pressure to appear that I was also receiving blessings from the Lord was huge on me. In no time, I started getting involved in various malpractices at my work place. As my job involved handling finances I started swindling my organization. It all began with small amounts and after noticing that I was able to get away with it, I stepped on the accelerator even harder. Soon, I was driving a nice car and started building a mansion in one of the city suburbs. My church friends who were shunning me before because I was not doing better financially finally began to befriend me again. We called ourselves “Sons of the Wonderful and Answering God (SWAG).” There was literally competition among us as we aimed at outdoing each other in “God’s blessings.” I continued to defraud my organization so that I could be on top of SWAG. Almost every Sunday, the man of God gave me the pulpit to share the testimony of God’s blessings in my life. So, all was well until last year when the cat went out of the bag and all the skeletons in my closet were exposed. I was arrested and charged as I have already mentioned. Anyway, to cut the long story short, I have been in this prison for over eight months now because I was denied bail. My pastor is no where to be seen. He has never visited me. All my property was seized by the authorities and my bank accounts were frozen. Every day, I cry for my wife and my two beautiful little daughters. I have put them in a great predicament all because of my sin and the so called prosperity gospel. Now, you may wonder why after this long time my first letter should be of this sort. Well, I have heard that you are studying for ministry. Please my brother, if God wills that you become a preacher of the gospel make sure that you preach the gospel of Christ alone. You should know that preachers have great influence on their members; therefore, please, please, use this God-given influence to lead your members to Christ and not to false hood and selfish ambitions. Lastly, please remember me and my family in your prayers. I have repented of my sin and I believe Christ has forgiven me, but I am ready to face the consequences of my sin which might be spending a number of years in this prison. What is Wrong with ‘Prosperity Gospel’? What is wrong with ‘prosperity gospel’? Before answering the question, it is good to put the record straight that ‘prosperity gospel’ is no gospel at all. The Bible is clear that there is only one Gospel (Galatians 1:6-8)and if I were to take at least one verse that summarizes this Gospel, I would go for John 3:16, “For God so loved the world, that he gave his only Son that whoever believes in him should not perish but have eternal life.” This is the Gospel. Anything that adds or subtracts from it is no gospel at all. Now, what is wrong with ‘prosperity gospel?’ First, it misses the mark on God’s chief plan for a sinner. It emphasizes that one should come to Christ in order to get material blessings not what is big in God’s plan of salvation namely eternal life. Secondly, ‘prosperity gospel’ robs God of his Godhood and renders Him as a vending machine. If one takes a closer look at ‘prosperity gospel,’ they will notice that it emphasizes on faith as means of obtaining blessings from God. So, God becomes a vending machine and the currency for buying on this vending machine is faith. You put faith in this vending machine and out comes a very big mansion. You slot in faith, and boom you have a top-notch job. You push faith in and the machine gives you an ‘all-eyes-on-me’ car. The moment you slot in faith, the vending machine spits out good health. If you a bachelor or spinster, you just have to put in faith, and the vending machine will give you a beautiful wife or handsome husband and a happiest marriage as a bonus. So, people become followers of God because He is like a vending machine that gives them their wants and not because they have experienced His true and amazing love and grace in their lives. It is similar to what Christ experienced while on earth. In John 6:1-71 we read that after Jesus miraculously fed 5000 men, He withdrew to a lonely place and later at night walked on the sea and joined His disciples as they crossed over to the other side of the lake. The next day, when some people noticed that Christ was not among them, they got into boats and followed Jesus to the other side of the sea. Upon meeting them, Jesus rebuked the people because their motive for seeking Him was wrong. He said, “Truly, truly, I say to you, you are seeking me, not because you saw signs, but because you ate your fill of the loaves. Do not labor for the food that perishes, but for the food that endures to eternal life, which the Son of Man will give you” (26, 27 ESV). In other words, Jesus is telling these people and us today that we should not follow Him because we want to prosper. Doing that is missing the mark. Rather we should follow Him because He is the way, the truth and the life (John 14:16). Jesus is not the vending machine that dispenses out material blessings at our will. He is the Lamb of God who takes away the sins of the world (John 1:29). Material possessions, not matter how huge, cannot satisfy us. It is God who satisfies. King Solomon explains this outstanding truth very well in the book of Ecclesiastes. King Solomon was a very prosperous man in every way (1 Kings 10:14-29). However, despite having all those riches, Solomon still felt that life was useless and was like chasing after the wind because he did not allow God to satisfy him. Eventually, God enabled him to realize that silver and gold cannot satisfy but only God and Solomon confessed and said: “All has been heard, here is the conclusion of the matter: fear God and keep his commandments for that’s the whole duty of man” (Ecclesiastes 12:13 NIV). We should realize that only Christ and not the riches of this world can satisfy us. For sure, “Our hearts will remain restless until they find rest in Christ” (St Augustine). 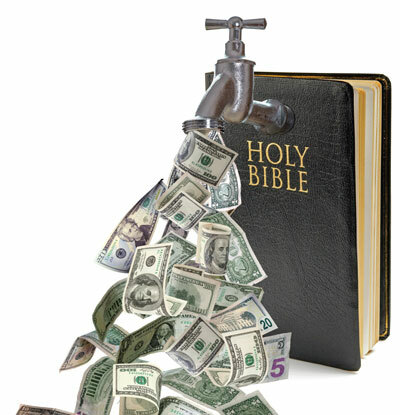 Thirdly, ‘prosperity gospel’ robs God of his sovereignty. By God’s sovereignty, we basically mean that God is in full control of what happens in heaven and on earth. He carries out all that he wills and nothing can stop His plans. In other words, when we say that God is sovereign, we mean that God is God. Now do proponents of ‘prosperity gospel’ recognize God’s sovereignty in the lives of his people? No, they don’t because they teach that if you are a Christian you should prosper and be rich. By such emphasis, they usurp the place of God and start determining the destiny of God’s people. They teach that it is God’s will for you to be rich. Now, is it true to say that it is the will of God that every believer should be rich and prosper materially? Turning to the Bible, which by the way is a final rule of faith and practice for Christians, we find so many examples of believers who were very dedicated to God but were not materially rich including Jesus himself who reminds us : “The poor you shall always have,” (Mark 14:7). Does this mean that Christians should always be poor? No, that’s another extreme which the Bible does not teach. Instead the Bible calls on Christians to work hard and trust God for their both spiritual and physical needs. In the model prayer which Christ taught His disciples and is also commonly known as the Lord’s prayer, Jesus teaches us to trust God to provide for us and He encourages us to ask: “Give us this day our daily bread” (Luke 11:3 ESV). God knows our needs; we should trust him to meet such needs one day at a time. Jesus also warns us of focusing our eyes so much on riches that we are blinded to the fact that God is the sole provider and sustainer when he says: “Take care, and be on your guard against all covetousness, for one’s life does not consist in the abundance of his possessions” (Luke 12:15). “Now there is great gain in godliness with contentment, for we brought nothing into the world, and we cannot take anything out of the world. But if we have food and clothing, with these we will be content. But those who desire to be rich fall into temptation, into a snare, into many senseless and harmful desire that plunge people into ruin and destruction. For the love of money is a root of all kinds of evil. It is through this craving that some have wandered away from the faith and pierced themselves with many pangs” (ESV). Apostle Paul continues with the word of admonition regarding focus more attention on riches than God in 2 Timothy 6:17: “As for the rich in this present age, charge then not be haughty, nor to set their hopes on the uncertainty of riches, but on God, who richly provides us with everything to enjoy” (ESV). And what is this ‘everything to enjoy’? Is it big mansions, expensive cars, and excellent jobs? No, it is Jesus! Jesus is everything that a Christian needs to enjoy. Jesus is the greatest provision that God has made for his children far richer than material blessings which are temporal. That’s why a Christian should echo the words of the Psalmist and say, “Whom have I in heaven but you? And earth has nothing I desire besides you. My flesh and my heart may fail, but God is the strength of my heart and my portion forever” (Psalm 73:25, 26, NIV).